Sharp. Sleek. Stunning. These are the words you’ll use to describe the 2019 Toyota Camry. Available in four-cylinder, V6 and self-charging hybrid powertrains, the Camry features a range of models and grades that let you pick the vehicle that suits your style. Regardless of your choice, every Camry delivers tremendous comfort, efficiency, style and technology – including, this year, Apple CarPlay as a standard feature on all models. The 2019 Toyota Camry LE Upgrade Package adds dual-zone automatic air conditioning, Entune 3.0 Audio Plus including Entune Safety Connect, an 8” Display Audio system, integrated Sirius XM Satellite Radio, the Blind Spot Monitor, Rear Cross Traffic Alert, and Back Guide Monitor safety systems, the Toyota Smart Key System with Push Button Start, a wireless charging system for personal electronics, an integrated garage door opener, and an auto-dimming rear view mirror with Homelink system and integrated compass. For those looking to maximize value – for example, in fleet service – the 2019 Toyota Camry LE Base Package reduces the MSRP by substituting some premium features with less expensive options. These include deleting the seat heaters, replacing the power-adjustable driver’s seat with a manually adjustable seat, and fitting the Camry with 16” steel wheels with wheel covers. 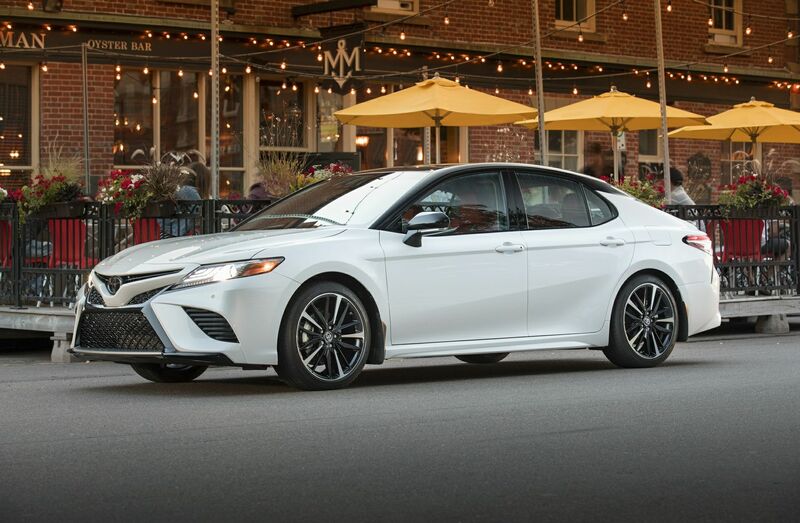 The 2019 Toyota Camry XLE Navigation Package is a new model for 2019 and adds 18” alloy wheels, Entune 3.0 Premium Audio with embedded navigation, and a JBL Audio system with 8” display and nine speakers. The 2019 Toyota Camry XLE V6 includes all of the features in the Camry XLE Navigation Package, plus the added power and performance of the 3.5L V6 engine. It then adds a number of Toyota safety technologies – including the 10” Head Up Display, Rear Cross Traffic Brake system, the Birds Eye View Monitoring system, and intelligent clearance sonar. The 2019 Toyota Camry SE Upgrade Package adds 18” alloy wheels, dual-zone automatic air conditioning, Entune 3.0 Audio Plus including Entune Safety Connect, an 8” Display Audio system, integrated Sirius XM Satellite Radio, the Blind Spot Monitor, Rear Cross Traffic Alert, and Back Guide Monitor safety systems, the Toyota Smart Key System with Push Button Start, a wireless charging system for personal electronics, an integrated garage door opener, a power tilt/slide moon roof, and an auto-dimming rear view mirror with Homelink system and integrated compass. The 2019 Toyota Camry XSE enhances its curb appeal with 19” alloy wheels, a panoramic glass roof, premium LED headlamps, LED Daytime Running Lights, and premium LED rear combination lamps. Inside, this model features dual zone automatic air conditioning, leather-wrapped steering wheel and shift knob, leather seat surfaces, heated front sport seats including an eight-way power adjustable driver’s seat and six-way power adjustable front passenger’s seat, auto-dimming rear view mirror with integrated compass, ambient lighting system and an integrated garage door opener. The XSE’s impressive list of technology features includes the Entune 3.0 Audio Plus system including Entune Safety Connect, an 8” Display Audio system with six speakers, integrated Sirius XM Satellite Radio, a 7” multi-information display, a wireless charging system for personal electronics, the Blind Spot Monitor, Rear Cross Traffic Alert, and Back Guide Monitor Alert safety systems, and the Toyota Smart Key System with Push Button Start. The 2019 Toyota Camry XSE V6 includes all of the features in the Camry XSE, plus the added power and performance of the 3.5L V6 engine. It then adds a number of Toyota safety technologies – including the 10” Head Up Display, Rear Cross Traffic Brake system, the Birds Eye View Monitoring system, and intelligent clearance sonar. The 2019 Toyota Camry Hybrid LE features dual-zone automatic climate control with humidity sensor, fabric seat surfaces, heated front seats, eight-way power adjustable driver’s seat, a 4.2” multi-information display, the Toyota Smart Key System with Push Button Start, 17” alloy wheels, and more. The 2019 Toyota Camry Hybrid XLE feature Entune 3.0 Premium Audio with embedded navigation, integrated Sirius XM Satellite Radio, a nine-speaker JBL Synthesis audio system with 8” display, leather seating, heated front seats, eight-way power adjustable driver’s seat and six-way power adjustable front passenger’s seat, a 7” multi-information display and 10” Head Up Display, auto-dimming rear view mirror with Homelink and integrated compass, leather-wrapped steering wheel and shift knob, leather door trim, aluminum scuff plates, ambient lighting and an LED cabin illumination system, an integrated garage door opener, the Smart Key System with Push Button Start, a wireless charging system for personal electronics, 18” premium alloy wheels, a power tilt/slide moon roof, Premium LED headlights and rear combination lamps, LED daytime running lights, and more. In addition, safety is enhanced with several technologies including the adaptive front lighting system, auto-levelling headlamp system, the Birds Eye View Monitor, Rear Cross Traffic Alert, Blind Spot Monitor, and Rear Cross Traffic Brake. The 2019 Toyota Camry Hybrid SE is the sporty hybrid, featuring all of the performance upgrades and styling cues of the “S” series plus the advanced performance and efficiency of the Hybrid Synergy Drive. Other features include Entune 3.0 Audio Plus including Entune Safety Connect, an 8” Display Audio system with six speakers, integrated Sirius XM Satellite Radio, heated front sport seats clad in sport fabric with leatherette trim, a 4.2” multi-information display, aluminum scuff plates, the Smart Key System with Push Button Start, integrated garage door opener, wireless charging system for personal electronics, the Blind Spot Monitor and Rear Cross Traffic Alert safety systems, 18” alloy wheels, a power tilt/slide moon roof, and more.